Women's Down With it Jacket is a fabulous addition to a ladies winter wardrobe. Patagonia took it's popular parka and turned it into a hip length jacket. 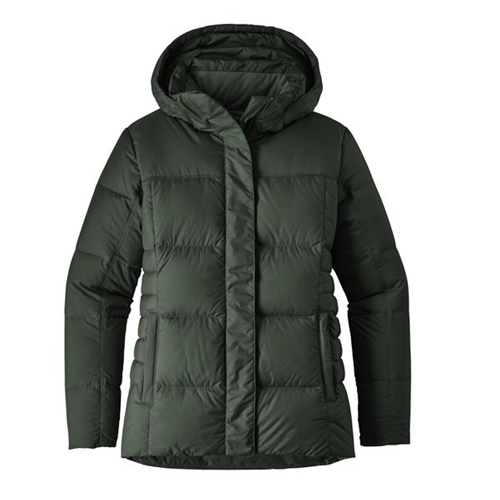 The Down With it Jacket is filled with 600 fill power duck down that can be traced from farm to factory to make sure the birds aren't force fed or live plucked. Because this jacket is slim fitting it is probably best to go up a size from your normal sizing. There is a water repellent finish on this jacket to help shed snow and light precipitation. With strategically sized baffles and princess seams, the Down With It Jacket creates a body- slimming silhouette that defies down’s billowy reputation. The shell is made from 100% recycled polyester treated with a DWR (durable water repellent) finish and insulated with Traceable Down (600-fill-power duck down traced from parent farm to apparel factory to help ensure the birds that supply it are not force-fed or live-plucked). The insulated, removable hood secures with sturdy plastic snaps and a wind flap conceals the 2-way front zip. Welted, on-seam handwarmer pockets have zip closures. An interior zip chest pocket secures valuables. Hip length.